The all-new 2019 RAM 1500 has a fresh take on the sort of durable and practical design that you'd expect from a RAM. The exterior has helpful details like standard LED headlamps, which help you see the road in inclement weather. Also included is an active grill shutter to keep the RAM's engine cool. The interior of the RAM continues this design philosophy, with an available 10 square foot panoramic sunroof and a choice of luxurious leather or durable cloth seating. See the stylish and tough all-new RAM 1500 by taking a test drive today at Southern Dodge Chrysler Jeep RAM. The 2019 RAM 1500 is built tough, so it'll provide excellent occupant protection in the event of an accident. RAM also includes a full suite of driver aids such as standard Blind Spot Monitoring which is optimized to use with a trailer and available Lane Departure Warning. If you're in Virginia Beach, Norfolk, Hampton, Newport News, Cape Charles, Eastville or Exmore, VA, try out the driver aids in the all-new RAM by taking a test drive at Southern Dodge Chrysler Jeep today. The 2019 RAM 1500 offers strong performance in all driving situations. A 305-horsepower 3.6L engine with hybrid eTorque technology comes standard, and a pair of 5.7L HEMI® V8s - with or without eTorque technology - are optional. The HEMI engines both kick out a massive 395 horsepower. Experience the power of the all-new RAM 1500 by taking a test drive at Southern Dodge Chrysler Jeep RAM today. You might not think of a full-size pickup as being full of cutting-edge technology, but the 2019 RAM 1500 is built to exceed expectations. RAM's Uconnect® infotainment system is available with a class-leading 12-inch high-resolution touchscreen. GPS navigation is optional to make sure you get where you're going. 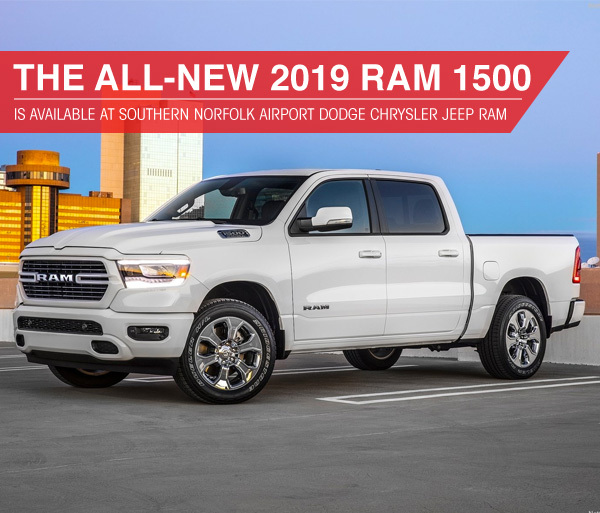 Drivers in Virginia Beach, Norfolk, Hampton and Newport News, VA can experience the tech in the all-new RAM 1500 at Southern Dodge Chrysler Jeep RAM today.